DST600 meter mounted in a dual port enclosure with a secondary RTD wired to an internal 4-20mA transmitter. A Turck 4 pin connector is provided on the secondary port for watertight access. A mating connector or cable assembly (available from Wahl) is used to provide access to the 4-20mA transmitter. 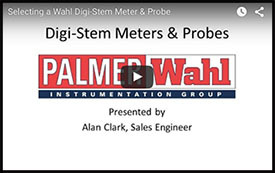 I Models: Digi-Stem RTD Meter, LCD, International ("AA" Battery included). 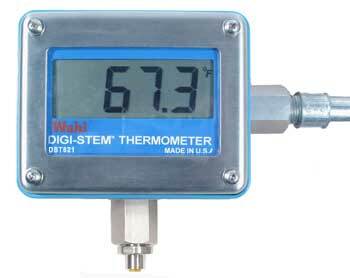 NB Models: Digi-Stem RTD Meter, (No Battery included). Requires purchase of C Battery from local supplier. Wahl's NEW! DST621 Mercury-in-Glass (MIG) thermometers, the only standard for years, may now be replaced with other technologies under the FDA's Final Rule for 21 CFR Part 113. 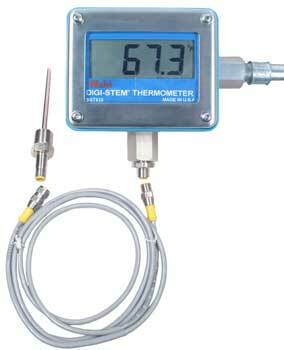 Wahl's DST621 is a digital 4-wire RTD thermometer, designed and manufactured using high reliability components to meet the Final Rules mandate that the Temperature-Indicating device be accurate to 1°F, and not be affected by EMI or environmental conditions. The Wahl DST621 also meets the current USDA 9CFR318.305 for canned meat and 9CFR381.305 for canned poultry products.. The Wahl DST621 meets and exceeds the FDA rules by incorporating self-checking technology which continuously verifies the accuracy of the electronics, and indicates any out-of-tolerance conditions, assuring that its accuracy and ability to function properly during processing are not compromised. Test temperatures are set at 180°F (82.2°C), and 250°F (121.1°C). Out of tolerance conditions will be displayed as an error, and immediately indicate to the operator if accuracy is not maintained, preventing under- or over-processing of product. The Wahl DST621 is the best reference standard against potential health hazards! The Wahl DST621 offers the highest precision temperature measurement technology with many unique features - making it the best choice for your processing needs. It has a field replaceable battery with a 2 year life, and provides a trustworthy alternative to MIG style thermometers with drop-in direct replacement. It is available with MIG standard tapered bulb chambers, or in a variety of probe configurations. The Wahl DST621 also features a 1" high LCD display - readable from 30 feet away! Calibration Records and the Final Rule "How to Successfully implement the recent FDA Final Rule 21 CFR on Temperature Indicating Devices." TID Installation "How to Successfully implement the recent FDA Final Rule 21 CFR on Temperature Indicating Devices." This product is not normally in stock. BEFORE REQUESTING A QUOTE FOR THIS PRODUCT! Please Click here to download the DigiStem Ordering Matrix. By selecting the options that best pertain to your application, we will be able to give you a more accurate quote.